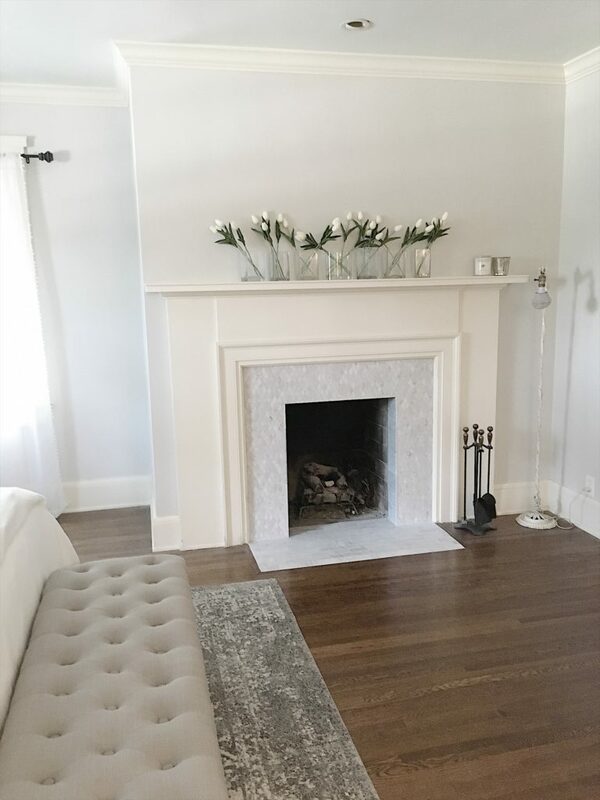 Today’s post is my chance to share my Renovation Challenges. I was hoping I would have nothing to talk about, but I am wrong! I have a lot to contribute to this topic. Back to the renovation challenges. These can be described with one word … delays. I am sure you are wondering what has caused the delays. I call it the Domino Effect. One thing happens to cause a delay in the roof which causes a delay in the master bathroom. 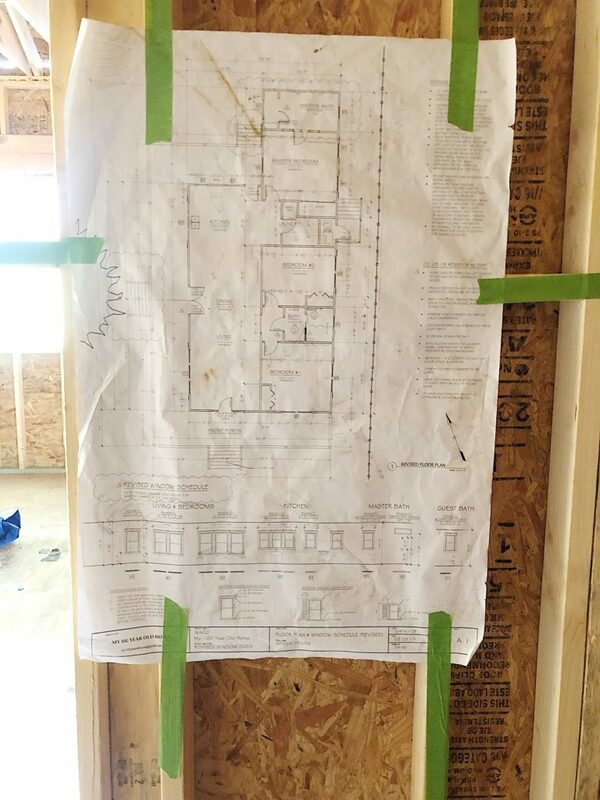 Another thing happens with the window order (it’s delayed) which causes a delay in the master bathroom. Then it rains outside for two days which causes a delay in the master bathroom. You have probably figured it out. My bathroom remodeling project is behind schedule. And yesterday I had a meltdown. But thankfully, today it’s all good. Here is my master bathroom. It looks a lot like it did last week. But we do have an almost finished roof. The delays are legitimate. But it is amazing how one minor delay in one area affects everything else. I have spent five days in Waco working on the home. My Texas trip started in Round Top and I bought three cabinets, a kitchen island, two doors, three trunks, four mirrors, two chandeliers, and a french chopping block. I shopped at Round Top with a list of specific items and found so many great vintage finds in just two days! Another one of the delays has been with the plans. Yours truly couldn’t make up her mind about the final design. But it’s final. As in really final. Or really final final. The Roof shingles should be installed this week and as soon as the windows arrive they will be installed immediately. But sadly when I booked this trip a few weeks ago, I assumed we would be already installing tile. Obviously, we are not. 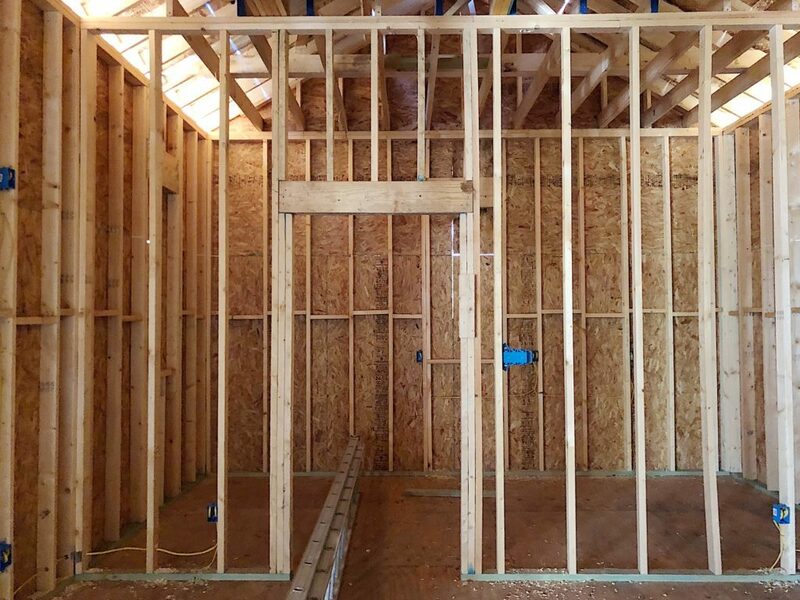 The rough electrical in the master bath was finished today and the rough plumbing starts tomorrow (which includes the shower pan). 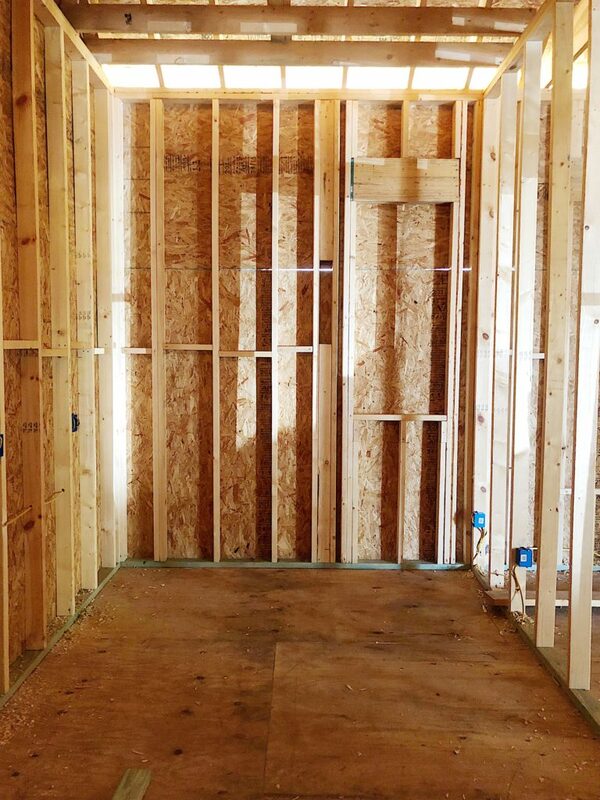 This view shows the area where the shower will be installed. It’s to the left of the doorway. 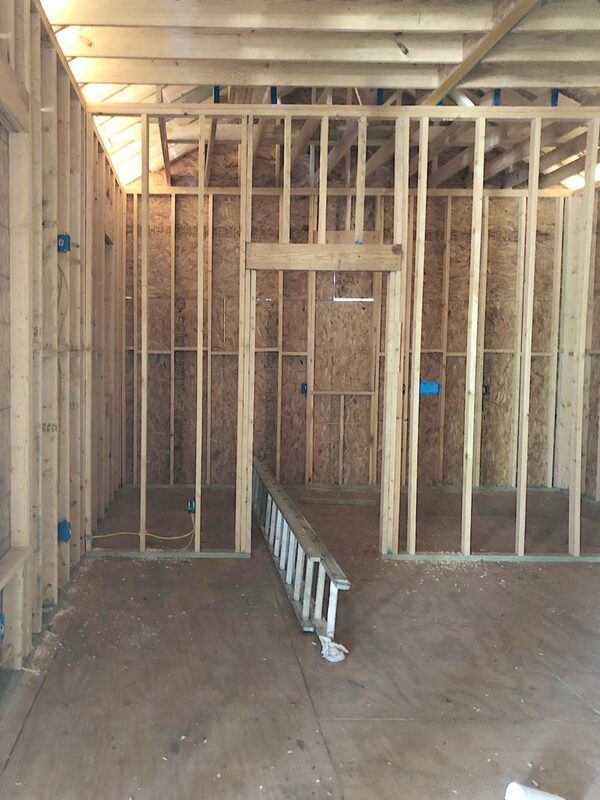 We are going to install one shower head on the left wall closest to us and another one on the back wall. Fingers crossed there aren’t any more renovation challenges. I spent the last few days looking for a vintage cabinet to use as a bathroom vanity. 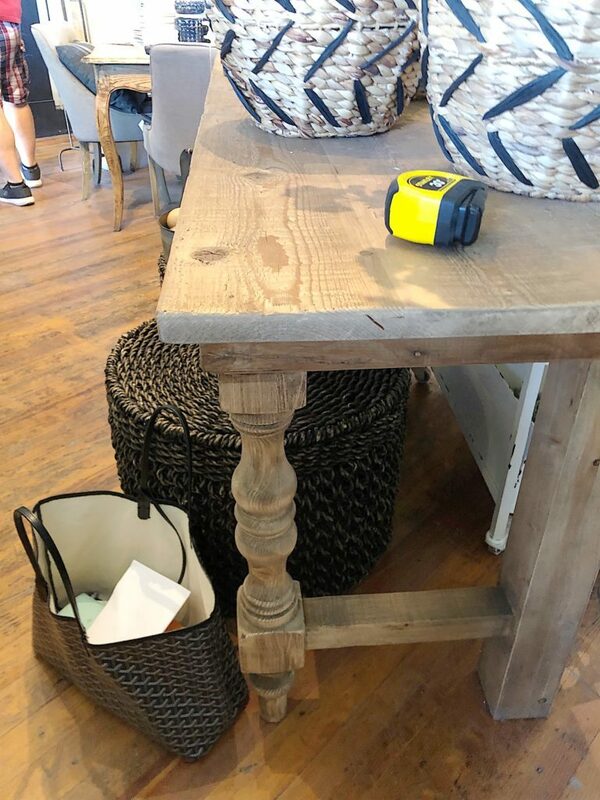 I really like this table I saw at The Findery, which is one of my favorite stores in Waco. I think it would look great if I added a shelf to hold baskets with toiletries. What do you think? We have a schedule that should get this project back on track. I can’t wait to share more with you next week! I love the vintage cabinet Leslie, but I wouldn’t put it in the bathroom. This house is to rent out right? I can see it getting destroyed with water. I would use it in another room of the house. Sorry for the delays…I feel your pain.